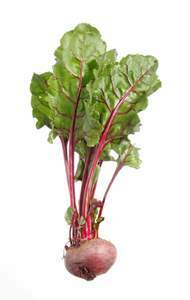 Beetroot is an annual which is quick and easy growing. Position: Prefers open and sunny but tolerates shade. Fertile, free-draining soil. Sowing season: Mid-spring to late Autumn. Sowing method: Soak seeds overnight (even 2-3 hours will speed germination) and sow thinly. Spacing: After 2-3 weeks thin out by pinching tops off plants to 5-10cm between plants, 30cm between rows. Watering: Mulch and keep well-watered or the roots will go woody. Don’t over-water. Fertilising: Occasional, with weak liquid seaweed or manure solution. Harvesting: Smaller roots have a sweeter taste. Twist leaves for salad off the plant instead of cutting them. Pick evenly to allow remaining plants to grow into the larger space. Suitable for: Containers (use smaller beetroot varieties) or vegetable beds. Good companion plants: Onions, Silverbeet, Lettuce, Cabbage, Kohlrabi, Dwarf beans. Hazards: Beetroot is quite hardy but protect during frost and water well in hot weather. Doesn’t like acidic soil. Common pests: Relatively free of pests. Storage: Cool, dark, humid. Cut leaves off about 5cm above the root before storing. Tips: As beetroot has a long growing season, you can sow each row 2-3 weeks apart so that you have a steady stream of beetroot rather than a glut.